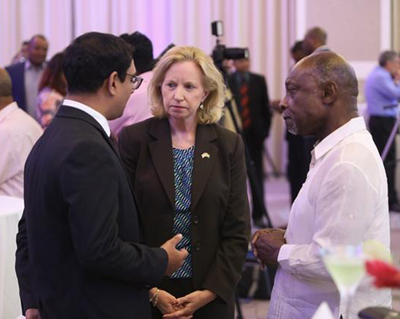 From left: President of AMCHAM, Zulfikar Ally, US Ambassador to Guyana, Sarah-Ann Lynch and Minister of Foreign Affairs, Carl Greenidge. across all sectors,” says newly-accredited US Ambassador to Guyana, Sarah-Ann Lynch. She was speaking at a welcome reception in her honour hosted by the American Chamber of Commerce Guyana (AMCHAM), on Tuesday evening. 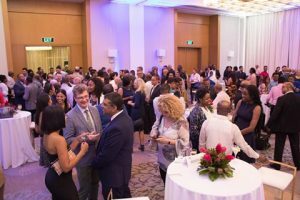 The event was also to formally launch the AMCHAM’s office in the Guyana Marriott Hotel. Given the increased relevance of Guyana in the international community, and attraction of the country as one of the preferred destinations for investments for American businesses over the last seven to eight years, President of AMCHAM, Zulfikar Ally explained that since the launch of the Chamber in August 2018, they already have 45 active members with 7 committees. Ally noted that their members can participate and contribute to the development of the organisation, share ideas for economic growth between Guyana and the US, and express and brainstorm solutions of concerns affecting their business. He welcomed Ambassador Lynch to Guyana and noted that the US envoy has come to Guyana at a convenient time when the increased business activity between the two countries has led to the creation of new relationships and strengthening of old ones.